Adventure Flights are a whole new way to look at the flight training experience! This innovate new idea from Owen Sound Flight Services gives you big time experience for little commitment of your time and energy. Adventure Flights put you in the pilot seat right away where you can fly, land and navigate the airplane with no prior experience required! For the true thrill seekers, we have Adventure Flights where you can experience stalls, spins and spiral dives, or show your skills in the cockpit by gliding to a grass runway after a simulated engine failure. Big time Experience, for small time commitment! These are all a part the normal exercises that each student pilot goes through on the way to getting a pilot licence, but we bring them to you without any of the studying or pre-requisites. All the fun, all of the experience! Which adventure are you up for? FLY IT is an exciting 2-hour flying experience where you get to be the pilot and fly the airplane! 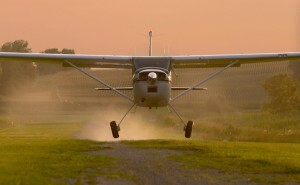 LAND IT is a challenging 5 hour flying experience where you will learn the basics of how to land an airplane! DAREDEVIL is a sensational 3-hour flying experience where you get to experience roller coaster type maneuvers in the airplane! WORST CASE SCENARIO is a thrilling 3 hour flying experience where you will learn how to handle one of the most challenging emergency scenarios in aviation; the engine failure! LATER, NAVIGATOR is a fantastic journey into what it takes to plan and execute a cross country flight, where you are the pilot, and the navigator! This program is coming soon, so stay tuned!